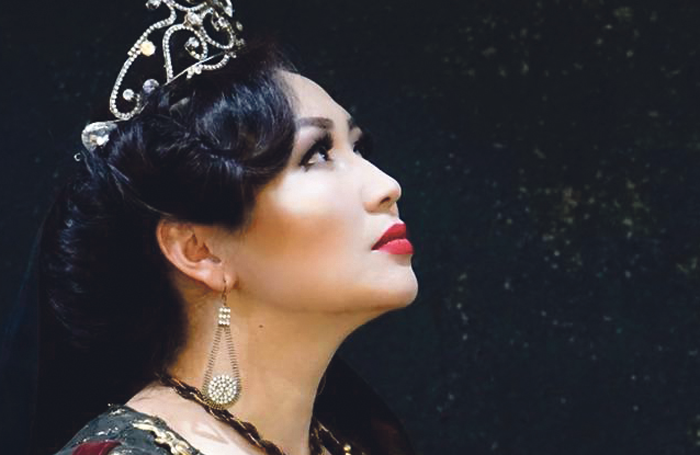 I recently returned from six weeks in Kyrgyzstan directing the first ever Kyrgyz translation of Macbeth, made from Russian into Kyrgyz, at the Kyrgyz Academic State Theatre in Bishkek. I worked with 30 Kyrgyz actors who spoke no English. I don’t speak Russian or Kyrgyz. To add to the mix, I took two British actors with me, Claire Cartwright and Steve Hay, who performed in English with the rest of the cast speaking Kyrgyz. They played Lady Macbeth and Macbeth respectively. There was also a fully Kyrgyz performance that was filmed and screened on state TV. So I had to deliver three different versions of the production in just over three weeks, as we performed four premieres with the cast variations. The challenge of that aside, the Kyrgyz state theatre method of working is entirely different to what we’re used to in the UK: the company comprises people who have trained there and are attached to the theatre throughout their working life, which has its advantages and disadvantages. The advantages are that they practise their craft every day, and are used to working as a company. They are vocally highly trained and easily fill an 800-seat theatre. They are physically grounded and able to experiment with movement and voice. For example, the Witches and Hecate invented a unique style of delivery, incorporating song and dance. The disadvantages are that they are not hungry for work in the same way British actors are. There’s a competitive edge missing, understandably, and it was noticeable that the younger actors were markedly less disciplined than the older actors who had trained under the old Soviet system. They seem more interested in television and film than theatre, despite their long tradition of theatrical performance. It was fascinating navigating huge cultural differences yet finding a common language in theatre. The production took place on a virtually bare stage with the actors providing a live soundscape and, through movement, a form of living scenery. We discovered that the challenge of acting opposite someone speaking a different language was surmountable when the intentions of the scene or particular line were clear. In fact, the particular challenge for the actors wasn’t so much the language but the differing approach to rehearsals and the text. It quickly became apparent that we adhere far more strictly to the verse, and are led by it, whereas for Kyrgyz actors that is just one element of the performance. Kyrgyzstan is a post-Soviet state with a huge love and respect for culture, though interest in theatre is waning and needs to be reinvented. This cross-cultural fusion was the brainchild of the current minister of culture, Sultan Raev, who invited me to direct the production after we met at the international Women and War festival I produced in London in 2016. I had intended to bring the cast to London, but since funding fell through, that is unlikely, though I think we have much to learn from one another. The production itself worked remarkably well given its disparate elements and the lack of rehearsal time. I would recommend the experience of working in such a different arena as it informs our practice and, especially with Brexit looming, the more we can develop international links and collaborations, the better.